Details: 3 Bedroom, 2 Bathroom Beachfront Residence, 1,265+/- s.f. White Caps beachfront condo for sale in Orange Beach. East end resort residence in White Caps condominiums. 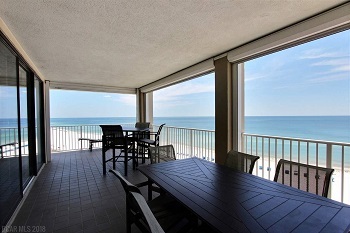 Every room has a gulf view, completely refurbished. Updated kitchen and baths including cabinets, showers, fixtures, hard surfaced counter tops and back splash, wet bar and upgraded stainless steel appliances. The resort home features all the bells and whistles with updated furnishings, tile and wood grain floors through out, plantation shutters on all of the windows and sliding doors, hurricane shutters and large wrap around balcony with a phenomenal southern and easterly panoramic views! Property amenities include covered parking for owners, outdoor pool with kiddie pool, indoor pool with hot tub, fitness center and gorgeous beach in a prime location! A few personal items will not convey.